This chili redolent with spices and bursting with chicken and white beans comes together quickly in 30 minutes or less. I graduated from high school in 1990. That means that I gained a lot of my culinary education (starving college student, food service worker, waitress, newlywed) in the 90s, the era of the Chicken Caesar Salad, Chinese Chicken Salad, and BBQ Chicken Pizza. What can I say but that we were into chicken? I have a very fond affection for those meals that were some of the first that I learned to cook. 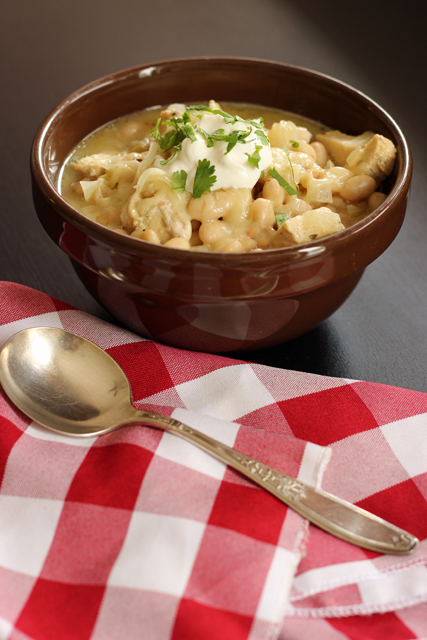 This “white” chili, made with chicken and white beans is one of them. In the good old days, everyone I knew had some version of “white chili”. And for good reason. It’s quite delicious! Each time I make it I wonder why I don’t make it more often. Oh yeah, I know why. Because I usually forget to soak beans. Next to forgetting to thaw, forgetting to soak is one of my big kitchen misdeeds. Cooking dried beans is such an easy, money-saving kitchen task, but it seems I often drop the ball. See the price comparison here. So last week when White Chili was on the menu plan and I saw that I had forgotten to soak beans (again), I made this chili with canned beans. Sure, it’s a little pricier to use the can, but not as much money as getting take-out that afternoon when my meal plan jumped ship. In fact, the convenience factor of canned beans totally ratchets this meal up on the “can be served often list”. Make it convenience and cheap and cook a few pounds of beans to freeze for later. The recipe calls for Great Northern White Beans, but you can use pinto beans without a problem. Pinto beans (dried or canned) are typically cheaper than white ones, so that’s a good cheap cheat to take note of. Likewise, you can substitute a finely chopped jalapeño for the chopped green chiles to shave off a little more coin. If you’ve got leftover roast chicken or holiday turkey, this is a great recipe for enjoying it with a slight twist. Not the same old leftovers here! Serve this chili with sour cream, salsa, cheese, and/or a sprinkling of cilantro to take it over the top. In a large stockpot, heat the oil until shimmering. Add the onion and sauté until clear, about five minutes over medium-high heat. Add the green chiles, garlic, cumin, oregano, cayenne, and ground cloves. Cook for about a minute until fragrant. Add the beans, stock, and lime juice. Bring to a boil. Reduce the heat and simmer for 15 minutes. Stir in the chicken. Add the cheese gradually, stirring to incorporate it. Once the chicken is heated through and the cheese is completely melted and incorporated, it’s ready to serve. Serve with the toppings. To freeze: chill the soup completely before storing in airtight containers in the freezer for up to 2 months. Dinner Every Night for Under $10? The 17 yo and I made this tonight. I had planned to double it but forgot to pick up an extra can of chilis. So, everything else is in the freezer and the teen can make the next batch now that he knows how to make it. 🙂 Although I was reluctant we agreed to follow the recipe–well, we used regular pepper since we don’t do spicy. I tasted it and thought it was missing something—the teen hadn’t added the cloves. Surprisingly, the addition of the cloves helped bring out the cumin flavor. Not sure what the lime does but it wasn’t bad whatever it does. My beans were more well done than normal and cold, so I didn’t try to drain much of the liquid off of them (I’ve heard that helps thicken). Anyway, thick, creamy, and flavorful. And since I had an extra set of hands I threw in a double batch of buttermilk corn bread. Yes, the cloves are essential! They make a huge difference. My husband likes his soups thick and creamy. Is there a way to give this soup a thick and creamy texture without store bought ‘cream of something soup’? My mom always added a cup of sour cream to her white chili at the end to make it super creamy! Just make sure to turn the heat off or down to low so it doesn’t curdle. You could mash or puree some of the beans. You can also try a cornstarch/water slurry to thicken it slightly. I think my favorite is mashing some of the beans, though. My hubby also prefers thick soups! Also, instead of soaking beans overnight, I just cook them in the crockpot all day long and they get plenty soft. I know some people claim better digestion when they do an overnight vinegar soak, but we haven’t noticed much problems with just an all-day cook time. Doesn’t help when it’s 4:00 and you forgot to start beans, but it is one less thing to do the night before! This soup sounds yummy, and I’ll have to try it with the lime and cloves. The others gave you lots of ideas. Adding the cheese at the end tends to make it creamy enough for me. You could also mash some of the beans and stir them back in. Yum, your recipe sounds good. I have a suggestion for making your dried beans a little easier. When I make beans, I just go ahead and make the whole bag (1 or 2 pounds), soak overnight and then cook them all the next day. When they’re done I divide them up into two cup containers and label and freeze them for when I need them. The 2 cup containers don’t take very long to thaw and that’s about how much would be in a can. This is easier for me, plus cheaper and healthier. Hope that helps. Yes! When I do do beans, this is what I do, but for our family, I cook 3 to 4 pounds and store them in 4-cup containers. We’ve gone past the one-can amount. Sigh. Part of my struggle is keeping up with the demand for food around here. Ha! I know what you mean, and I only have two teenagers! I can’t wait to try this. Quick question… do you drain the canned beans or just put them in liquid and all? Thanks! Drained. Sorry I didn’t list that. PS I used the canned Great Northern beans and did not drain them. They were wonderful and looks just as thick as your photos. I'm sure for dried beans the liquid may be a little too much, though. Hi Jessica ~ I made your chicken chili, it was amazing and easy to make ~ Thank you.. I made this and it was amazing ~ thanks Jessica for the recipe! How do u reheat from froZen? Stovetop? Crock pot? Either of those, or the microwave. Funny, but chicken caesar salad, Asian chicken salad, barbecued chicken pizza and white chili are all among my favorite foods, and I had no idea they were a 90s thing! I guess because back then we were afraid of fat in other meats? Your chili looks good; I’ll have to try it. They’re all good, aren’t they? I have half of a sliced pork tenderloin that I need to do something with. It’s already been frozen and we’ve had pork chops twice from the whole thing. Do you think I could use pork in this recipe? Any thoughts? Thanks! 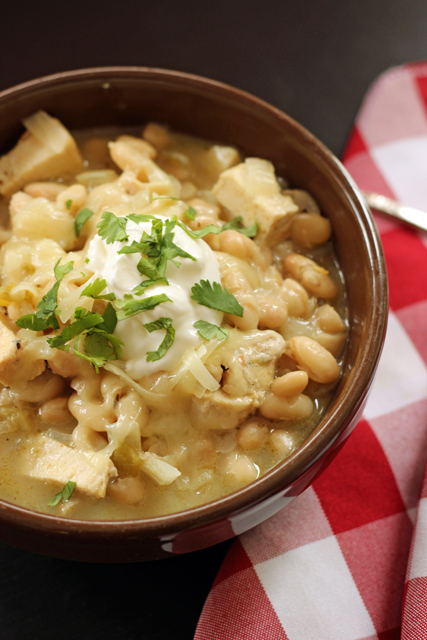 This recipe is super close to one I’ve kind of landed on by mixing and matching over the years between various white chicken chili recipes. BUT the amount called for is small enough that I think I can handle it! As a side note, I use cans of creamed corn to thicken my version. That and some cornstarch as others suggested above…We also like mushrooms and diced bell pepper in ours as well, just to try and squeeze in as much veg as possible.